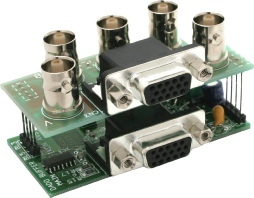 The DAB-BNC board has a front panel HD15 for VGA IN, a second buffered HD15 for a monitor output and internal buffered BNC sockets for the display, it is designed for use with 5 core RGBHV coax cables. The unit requires an external 12V power supply at 60mA. It is capable of driving signals 60m and has a 260MHz bandwidth. Dual screw terminals are provided for power allowing the looping of a single power supply to multiple buffers.